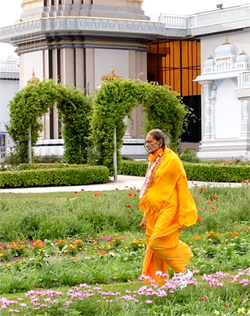 Kripaluji Maharaj persists that you should be tearful when you ask God for His love. Tearfully call out to God in whatever language is dear to you, but you have to shed tears. With shedding tears there is one condition: don't bring any worldly desire before God. There are two kinds of desires: bhukti, mukti. Material happiness of any kind up to Brahma’s abode is called bhukti, and attaining God is called mukti, apavarg, kaivalya, mokch. Throw both of them far away from you. They are both like demonesses. Leave anyone who is under their influence. The more dangerous of these two is mukti. So just cry and beg Him for His Divine vision and don’t ask for the world. Don't have any pretence or deception. However you are, go like that. If you fake anything, then God will do a left about turn from you. You will have to become like an innocent child. You were all innocent at the beginning. As you got older, your elders taught you all this contrived behavior in your own home so we could deceive others. Now if you meet a Saint, you also apply your intellect there. "Is this Saint a true Saint, just a devotee, or a faker?" What is the situation of that intellect that is determining this? You can’t even tolerate hearing one word from someone. Someone said you are a donkey, a fool, lustful, angry, greedy, deluded. Your heart starts burning just from some words. Alright, so tell me, have you attained God realization? No. So then you are still under the control of maya, right? Yes. So then you are still lustful, angry, greedy, etc. Accept it! You might say, "I'm listening to what you are saying and I don’t feel lustful, angry and greedy." But after you get up, if someone shoves you, "Hey!!!" From just one action, you go crazy, even though you have the human body’s highest class of intellect. For this reason, always regard yourself as lustful, angry, greedy, and deluded. It is a fact we are like this. So why don’t we accept it? Why don't we like it? So before God we have to become like a baby who is without artifice, hypocrisy, pretence and deceit and beg God for His love. Whatever form is pleasing to you, imagine Him in that form. Whatever name is pleasing to you, use that name. Whatever virtues, leelas, decorations are pleasing to you, imagine those. Don't be scared. Dress Him in pants and pitch a ball to him, "Come on Shyamsundar! Let’s play cricket!" Just think, if Krishn were to descend today, would His mother and father dress Him in a peetambar and send him to school? God has all the forms. Sometimes He becomes a woman, a young boy, a young girl or so old that He has to walk with a stick. These are all His shringar. Whatever style of decoration a mother and father find pleasing, that is how they are going to dress their child. It has always been like this in every age. But whatever you like, imagine Him dressed and decorated accordingly. Do all this with your mind, because if you do external Deity worship, you will feel inadequate, "If I were a billionaire, I could decorate Shyamsundar with a $10 million diamond necklace." But you don’t have money. But why think like this? In the Bhagwatam, eight kinds of Deity worship are described. One of these is manomay. Do it from your mind wherever you are. If you have to take a Deity from here to there and there to here – it’s a problem. And the Deity you imagine in your mind you could adorn with a $10 million diamond necklace. Whatever clothing you like, whatever decorations you prefer – you can keep on changing and without spending any money. This doesn’t make any difference to God.